Toman receives homecare, medical assistance and financial support from the Claims Conference, as well as a monthly pension from the Central and Eastern European Fund. Picture in my first citizenship certificate in 1941 before I left for Theresienstadt. Toman Brod, born in 1929, grew up in a well-to-do assimilated Jewish family in Prague, which he described as “an idyllic city” before the war. He never experienced anti-Semitism and had Jews and non-Jews as friends. Toman recalls the delicious food that Anci Kopska, the family’s cook, prepared, including “superb” bread dumplings, “unvrivaled” sauerbraten, and the “indescribable taste and indescribable aroma” of her cakes. Toman recalls that Anci even sent him one or two packages of food when he was later in Auschwitz. His childhood was full of playing with his brother, swimming, skating and soccer. Toman’s father died in 1938, and after that, Toman recalled that anti-Jewish measures grew continually worse, with new restrictions constantly eroding the placid existence the family had known. Toman was 13 in 1942 when the Nazis forced him, his mother and brother out of their home and into Theresienstadt, where they spent 18 months before being deported to Auschwitz in December 1943. “The first impression was so terrible, and the horror of those buildings, they probably used to be stables, maybe for horses, and now they had six or seven hundred people stuffed into them. On top of that of course the brutality of the functionaries, the SS… Basically the entire shock of arriving in Auschwitz was horrible. You know, those are the various degrees of horror. Now we had once again sunk to a lower level, to a higher category of horror,” Toman recalls. Toman managed to get into the children’s block at Auschwitz, where life was somewhat easier than for the adults as the children could stay inside. By the following summer, his brother had died in a labor camp and his mother had been gassed. 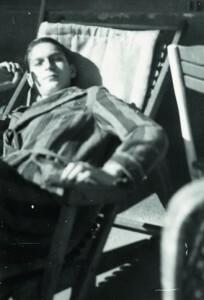 The infamous Josef Mengele selected Toman to work in the men’s camp, which was followed by two others, where he became ridden with lice, worked under brutal cold and starvation, and eventually fell deathly ill. This is what I looked like when I returned home from the war. The photo was taken in Prague in 1945. Toman was liberated in May 1945, and after several weeks of recovering from illness, made his way back to Prague and lived with Anci, who he credits with saving his life by nourishing him back to health. 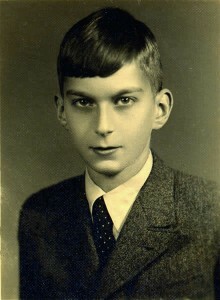 Toman eventually finished high school and graduated from university in 1955 with a degree in history, obtaining work with the Military Historical Institute and becoming a sought-after historical lecturer. 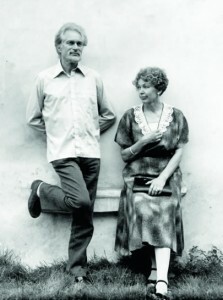 He also married, and Anci cared lovingly for the couple’s daughter until she died in 1963. After toying with the idea of emigrating, Toman and his wife were thrown out of the Communist party and there ensued about two decades of difficulty finding work. Me and my beautiful wife Libuse in the 1980s at Na Frantisku in Prague. Today, Toman lives in the center of Prague in a small, book-filled apartment that reflects his postwar years as a historian. He takes great pride as an author examining Czech history and as a lecturer on the Shoah. Now 86, he has age-related health issues such as high blood pressure and hearing difficulty. He receives homecare, medical assistance and financial support from the Claims Conference, as well as a monthly pension from the Central and Eastern European Fund. Read Toman’s full interview about his life on the website of Centropa, which receives funding from the Claims Conference to help perpetuate Holocaust education and remembrance.